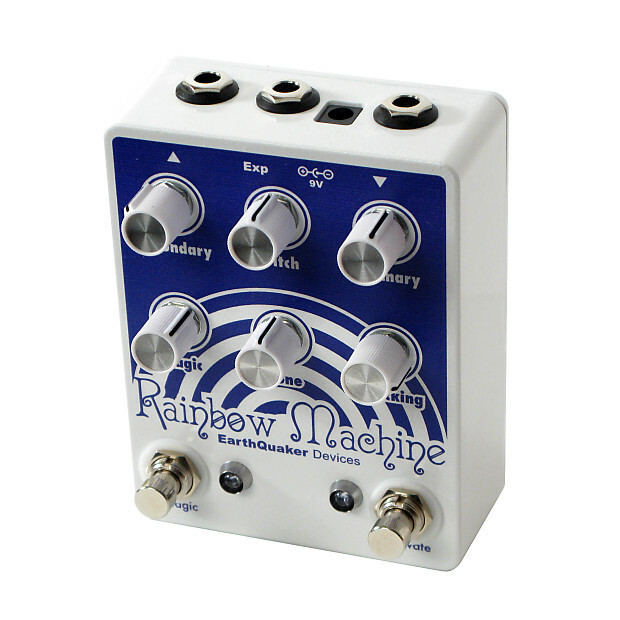 Stop me if you’ve heard this before: Welcome to the Rainbow Machine™, in all its synthetic glory! This one is for experimenters, adventurists, and noisemakers. Totally not for purists and/or tone hounds. There are no “natural sounds” that come from this box. It takes modern DSP and uses it as a tool of future past to create real-time pitch shifting using digital oscillators. Stop? 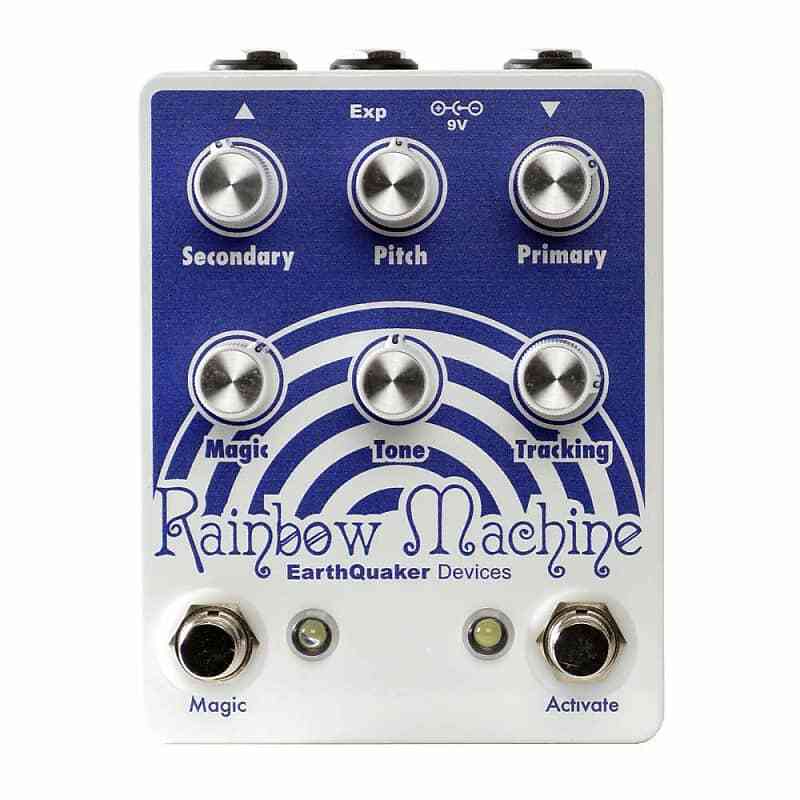 Okay, fine, but what if I told you the Rainbow Machine has been completely re-imagineered from the pixie dust-covered ground up to be more versatile, twice as loud as the original, with an extended delay time, deeper chorus tones, silent Flexi-Switch™ foot switches on both the Activate and Magic functions, and most of all, has more Magic? The Rainbow Machine is built around a DSP pitch warping engine that’s designed to be slightly imperfect; colored with digital remnants of the cosmic dust we’ve picked up across the multiverse. That is to say it’s a cold digital beast made to pretend it has feelings. The Pitch control adjusts the frequency of the polyphonic pitch-warped harmony from a fourth below your input, to a third above, and every atonal pitch in-between. Noon is the unison position. Use the Primary function control to adjust the volume of the polyphonic harmony. You may add in an accompanying octave or thicken the modulation by bringing up the Secondary function control. The Tracking control adjusts the lag time between the wet and dry signals, and the Tone control rolls off some treble for a darker, “vintage” sound. Clockwise is bright, counterclockwise is dark. 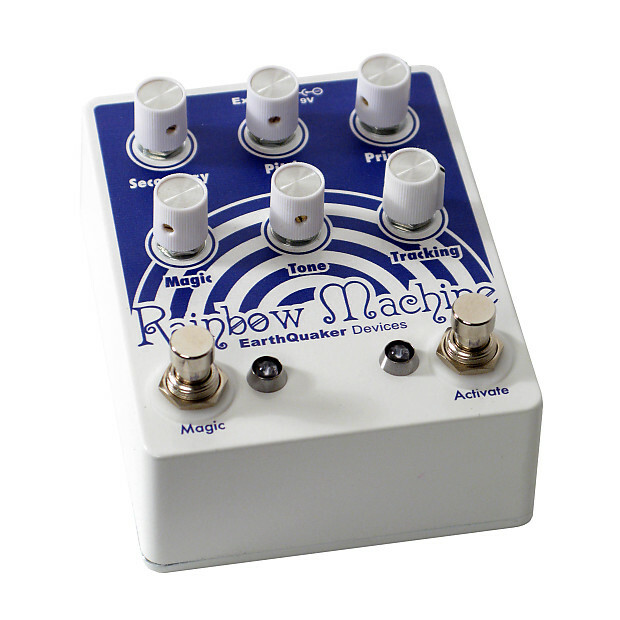 [Pro Tip: The Rainbow Machine’s pitch warping behavior is entirely dependent upon the Pitch knob’s position relative to noon. Set above noon, echoes, pixie trails, and other effects will ascend in pitch as they sustain. With the Pitch control below noon, any lingering effects will descend in pitch. This becomes extremely important when using the Magic function.] The Secondary control adds an octave of the Primary harmony. When the Pitch control is above noon, Secondary adds an octave above the harmony. When the Pitch control is below noon, the Secondary control will add one octave below the harmony. With the Pitch set to noon, the Secondary control adds an additional chorus voice for modulated, triple-tracked tones. Use this control to blend in faux-shimmer sounds or a low-frequency rumble. It’s up to you. From there, it’s only a matter of how weird you wanna get. And you can choose how weird you wanna get with the Magic control. This is a regeneration control that creates aliasing (among other things) by feeding the Primary and Secondary signals back on themselves and each other, and a bunch of other stuff no one understands. With the Magic engaged and the control set low, you can squeeze a few extra repeats out of whatever setting you happen to be using. As you increase the Magic control, you’ll start noticing increased ambiance, resonant, edge-of-oscillation pitch-shifting delays, chorus, metallic digi-flanging, ascending (or descending) pixie trails, controllable self-oscillation, squalls of synthetic noise, whale song, and finally, distortion. It’ll take you way beyond and open up your third eye, trust us. In conjunction with the Tracking control, the Magic creates wild pitch take offs and descends, chaos chorusing, shrieks, groans, gurgles, briggles, bruggles, bridals, wizard-blessed wizardry, signal transformation, imminent destruction, and other general mayhem. Each and every Rainbow Machine is harvested by hand in the (pixie) dusty Rainbonium mines of sunshiny Akron, Ohio, USA. All products ship within 2 business days! Any orders shipping outside the Contiguous USA will incur an additional shipping charge. If this is the case, please contact us directly before placing an order to get a shipping quote. Based on purchase price of $229 at 10% APR for 12 months. Excludes tax and shipping fees, to be calculated at checkout. Rates range from 10-30% APR. Choose from 3, 6, or 12 monthly payments.